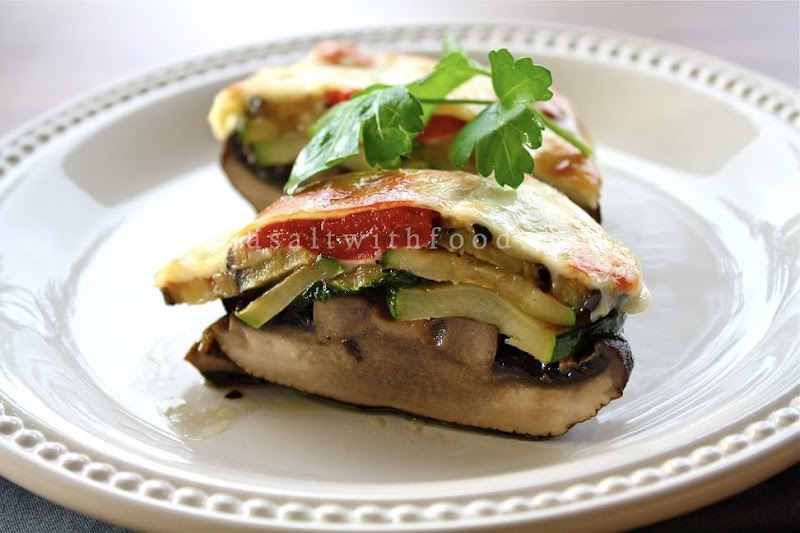 This is an elegant oven baked Portobello Tower appetizer. 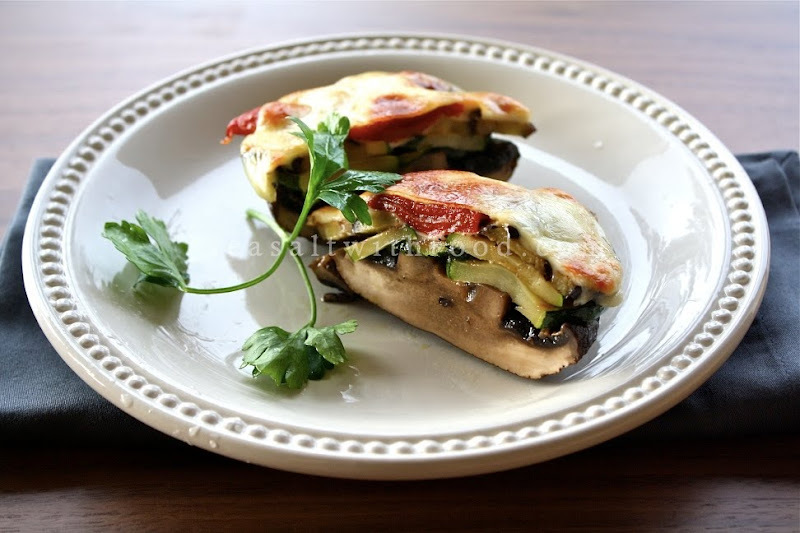 The Portobello mushrooms are simply mated with zucchini, eggplants, bell peppers, and a variety of cheese. Prepare the layered vegetables ahead of time and then pop them into the oven just before serving. Easy. Preheat the oven to 450˚F. Clean the mushrooms. Lightly coat a 13 x 9 x 2-inch baking pan with olive oil. Place the mushrooms, cap side down, in the pan and bake for 10 to 14 minutes, or until the mushrooms are tender. Sprinkle with salt and pepper and reserve. Don’t turn off the oven or clean the pan. Heat 1 to 2 Tbsp of olive oil in a large nonstick skillet over medium heat. Add the zucchini slices and sauté, turning once, until lightly browned, about 5 minutes. Remove with a slotted spoon, sprinkle with salt and pepper, and reserve. Remove the stems from the eggplants; halve each lengthwise, and then cut into ¼ inch crescent slices. Adding more oil if necessary and keeping the skillet hot at all times, add the eggplant and sauté, turning once, until lightly browned on both sides, about 5 minutes. Remove with a slotted spoon, sprinkle with salt and pepper, and reserve. Re-oil the baking dish, if necessary, and add the mushrooms, create the layers by topping each mushroom with the zucchini, eggplant, provolone, red pepper, and mozzarella on top. 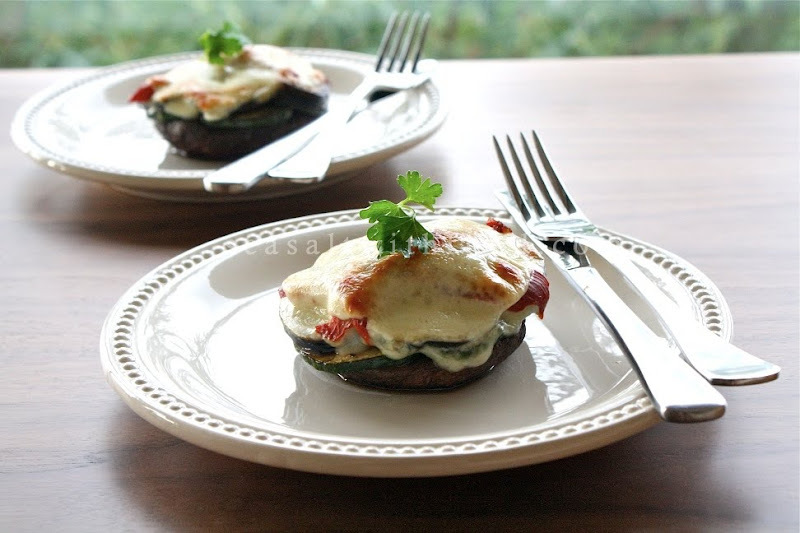 Bake the Portobello tower for 6 to 8 minutes, or until the cheese has melted and ingredients are heated through. Allow to rest for 5 minutes, before serving. Angie, it's gorgeous, the layering and all. You are such a marvelous cook I can't wait to see you in person! Thanks for sharing the recipes!